CDC and wedding survival: A new guide to protect your big day from disaster. 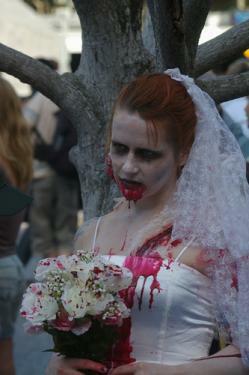 Zombie wedding? The CDC’s got you covered. Like their earlier guide to surviving a zombie apocalypse, the wedding manual is clearly a goofy attempt to convince us that the CDC is cool and not just full of safety nerds. It will also no doubt make a lovely example for those who like to lament the misuse of precious taxpayer dollars, but it actually does offer some useful advice. The bridal kit should include extra safety pins, makeup for touchups, maybe a few sedatives. It also wouldn’t hurt to have the essentials from a home emergency kit or “go-bag” by your side. You never know when you might need to bandage up a clumsy flower girl, revive a passed out reception guest, or even evacuate. A first aid kit, bottles of water, snacks, medications, extra cash, and important documents are just a few of the more practical items to have handy. If you’re the bride, add this to the list of things you need your maid of honor or someone in the bridal party to put together for you.